Bright rosy-pink single flowers, broadly banded white on the margin, with golden yellow anthers. Erect growth with pendulous branches, forming a slightly spreading bush. Flowers March to April. Bright rosy pink single, broadly banded white on the margin, anthers golden yellow. Growth erect with pendulous branches. Mid to late season flowering. 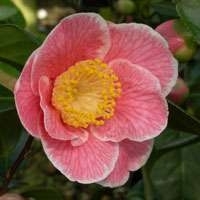 I wasn't expecting that the Camellia would be in full bloom after having travelled so far but it does. It is gorgeous and full of buds. I absolutely adore it. Thank you for wrapping it in such a delicate way and for protecting it so well. Ordered online and received the next day. Plants in 5 litre pots were very well packed and received undamaged. The plants are of very good quality and shaped nicely, all the leaves look healthy. Cannot comment on flowers as only just received and potted up, but have no doubt they will be stunning. Overall a fantastic service; would definitely recommend and use again.